Stormy weather caused the Transocean Winner, a 17,000 ton oil rig, to break free of the tug line that was pulling it out to sea. A few hours later, it ran aground on a Scottish beach. Fortunately, the tug boat had been hauling the Transocean Winner to a scrapyard, so the rig was empty when it hit the coastline. 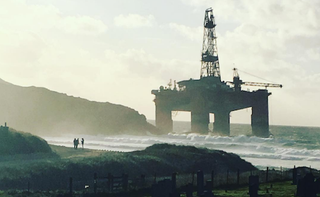 Still, 280 of those 17,000 tons are pure diesel—and that fact has Scotland’s coastguard warning people to steer clear of Dalmore beach until the rig can be cleared. The rig is so huge that even from a distance, it was pretty unmissable. Here are some of the best shots local photographers were able to snag.